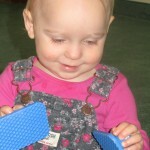 Zig-Zag blocks are great fun! Across the education system budgets are being squeezed. Sadly, the first thing to be placed on the chopping board is often Arts Education. This is no surprise because, all too often, success is measured solely on academic outcomes. But here’s the thing: the arts are vital for our children and they need to be saved! Being immersed in arts cultivates cognitive abilities, nurtures positive character traits, and fosters critical thinking. It’s true for babies, kids, and teens. This is why it’s so important for parents and arts educators to make their voices heard. Basically, the arts rock! and it’s vital they remain at the heart of our education system.